215 x 145 mm. – 38 leaves. With 2 miniatures of the herald and 35 coats of arms in pen and wash. One coat of arms (Orange-Nassau, 16th century) added in gold and colours on vellum. Illustrated manuscript in Dutch, made by Herald Nassau-Vianden in the service of Count Engelbert II of Nassau. Brabant, Breda or Brussels?, c. 1485-1495. 215 x 145 mm, 38 leaves, paper. Two miniatures of the herald and 35 coats of arms. f. 20: Coat of arms (without subtitle, but is Nassau-Heinsberg): lozenge shaped, the escutcheon showing the arms of dexter (husband) and sinister (wife). An armorial made by Herald of Nassau-Vianden in the service of Count Engelbert II of Nassau. The present manuscript, dating c. 1485-1495, opens with a pen-and-wash drawing showing the Herald of Nassau-Vianden greeting what must be the arms of Engelbert II of Nassau. Next follow twice, sixteen coats of arms of Nassau-Vianden, of Engelbrecht’s parents Jan IV and Maria van Loon-Heinsberg – as represented on the design of their double portrait on a now lost Nassau tapestry (now in the J.P. Getty Museum). This is a newly discovered armorial and, presumably, the oldest with heraldic information on the Nassau ancestry. Such a reference was necessary, not to say indispensable, for many functions and responsibilities, the least of which to justify the position of power in society. For representation, to show status and rank (especially at funerals), the knowledge of lineage and alliances gathered by heralds was imperative. 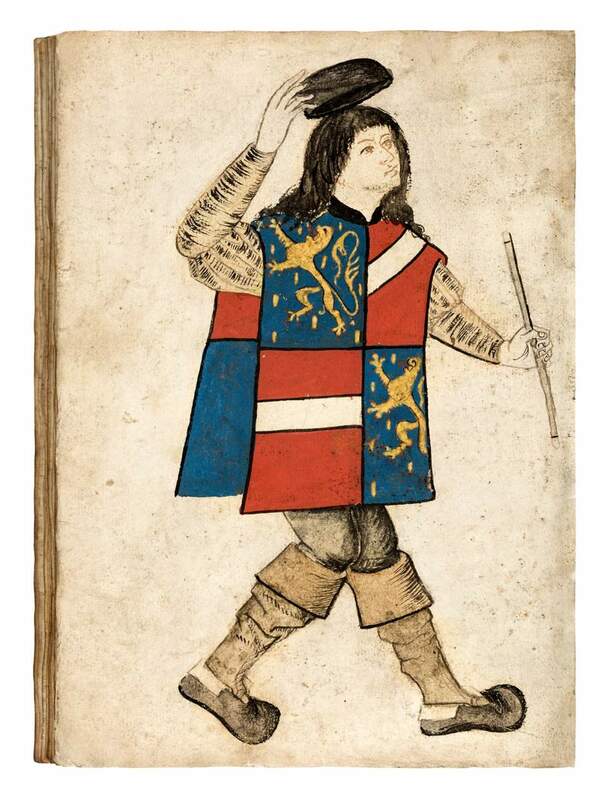 Most of this early heraldic representation, which was found on stained glass windows, on the Breda-Nassau memorials, or on the famous tapestries of the ‘Nassau Genealogy,’ is now lost or incomplete – enhancing the historical value of the manuscript at hand. The correct order of the leaves in the manuscript is under discussion. This manuscript is now in the collection of the National Libary of the Netherlands at The Hague.